Villa Ventana is an architectural masterpiece, infusing traditional and modern Mexican design, and one of Puerto Vallarta’s most precious gems. This stunning 9,000 sqaure foot Luxury Villa comes complete with 3 levels, 4 master bedrooms, 5.5 baths, media room and all the latest finishing’s and details. Perched on a high hill above Puerto Vallarta’s romantic district, Villa Ventana is a paradise you’ll never want to leave. Villa Ventana is a new luxury four master bedroom, five and one-half bath, three level, media room, 9000 square feet modern Mexican Villa completed in 2007 following two years of construction and meticulous finishing. The Villa is an architectural masterpiece, infusing traditional and modern Mexican design, with attention to detail that is unsurpassed in Puerto Vallarta. A connected (but completely separate and private) 1,000 sq/ft two bedroom 2 bath luxury view apartment with Jacuzzi spa pool (on deck with city and ocean views) as well as a two full floor three bedroom penthouse condominium with private infinity pool (located at Casa Ventana just across the street from Villa Ventana) are available as an add on if additional space is required. Villa Ventana is perched on a hill high above Puerto Vallarta’s romantic district (Los Muertos Beach area) in Las Amapas (just south of Old Town), with expansive and unobstructed views of all of Puerto Vallarta and the entire Bay of Banderas and Pacific Ocean beyond. Villa Ventana is owned by the same owners of an award winning luxury boutique resort in the Fiji Islands, Qamea Resort & Spa. As such they have a solid understanding of how to deliver a quality product. From professional service, comfortable beds with high thread count Australian cotton sheets, tasteful local and international art, a fully qualified spa therapist, and a city and ocean view that is breathtaking. Entry into Villa Ventana is from Calle Gardenias. When you step through the oversized wrought iron metal entry door, you will walk past an internal garden with a two-story waterfall and onto a landing overlooking the living room below, large heated infinity pool (heated during winter months only), and expansive views of the city and ocean. 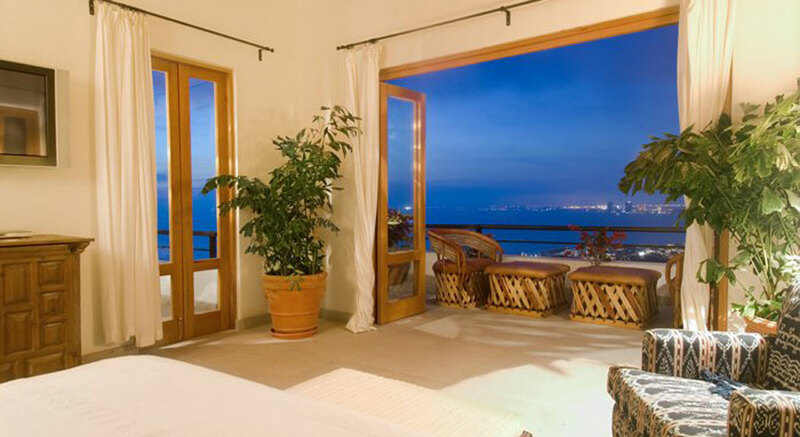 On the top floor of Villa Ventana is the first master bedroom, with wrap-around private balcony, en suite bathroom with a bath tub where you can enjoy a full ocean and city view in privacy, indoor and outdoor shower, and a 42-inch plasma screen satellite TV. Walk down the dramatic staircase into the living room with two+ story vaulted brick ceilings, gourmet stainless steel kitchen, indoor/outdoor Bose sound system, and dining room. Bi-fold oversized wood doors open up the entire living and dining room onto a large deck that wraps around the entire second floor. On the deck, there is a large heated* infinity swimming pool, Jacuzzi spa, comfortable deck furnishings, and a second outdoor living area with built in sofas. This floor also boasts a second full master bedroom with plasma screen satellite TV, and a media room/library also with satellite TV and electric keyboard piano. On the bottom floor of Villa Ventana is a third living room with two additional master bedrooms, each with two full size beds, private en suite bathrooms (with shower only), and balconies with expansive city and ocean views. All bedrooms are fully air-conditioned (remote control), and all water into the house goes through a state of the art water purification and filtration system. Throughout your stay at Villa Ventana, you will be pampered by our house manager and personal spa therapist, Lette, in addition to a full time maid and full time chef. Make sure to book a relaxing in-house massage or Guinot facial during your stay; you will not be disappointed. The Villa’s staff is available to prepare breakfast and lunch or dinner for an additional fee. Mexican meals as well as fresh creations infusing many different cultures. Puerto Vallarta is very accessible on foot, it is easy to walk everywhere in Old Town. The Malecon sea wall, Main Plaza and Cathedral of Guadalupe downtown are located in the heart of the city. This area offers a wide variety of upscale boutiques, world class restaurants and high end art galleries. The main public beach in town, Los Muertos Beach, is in the “Romantic Zone” and runs parallel to Olas Altas street, just a 10 minute walk south of downtown, a quaint area with sidewalk cafes, resort clothing stores, coffee shops and internet cafes. Basilio Badillo or “Restaurant Row” is also in the Romantic Zone and is lined with unique jewelry and clothing stores, art galleries and popular restaurants.